I cannot think of anything better than a cake buffet at a wedding. Go ahead, I dare you, name something better. These divine, magnificent, decadent, delicious cakes all came from Simply Desserts in Fremont, WA. Tiffany and the hotel did a wonderful job setting up this buffet. The only things provided by us were the cakes and the black chargers (found at Wal Mart for $2 each), and the only directions I gave were to turn milk crates upside down under some linens to give the table some height. Those gorgeous linens, the candles, the candles, and the puffy little plants were all a surprise to me and I loved it all. 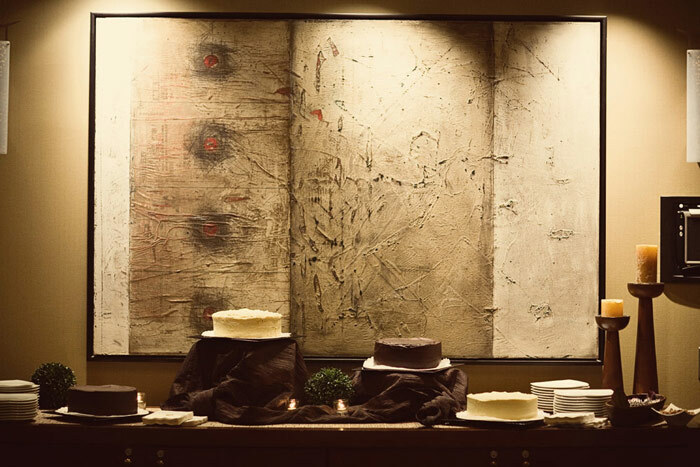 I wish they had taken the time to slide the cakes off the cardboard and have them sitting right on the platter, but I figure all of our guests were probably so busy focusing on that decadent looking cake they didn't even notice. In the middle of the room, across from the cake buffet sat our strawberry white chocolate cutting cake. I had considered several different topper options, and was close to restoring my grandma's topper from 1959 when That Mother told me she had talked to my aunt and asked if we would be able to borrow The Opera Singer for the evening. 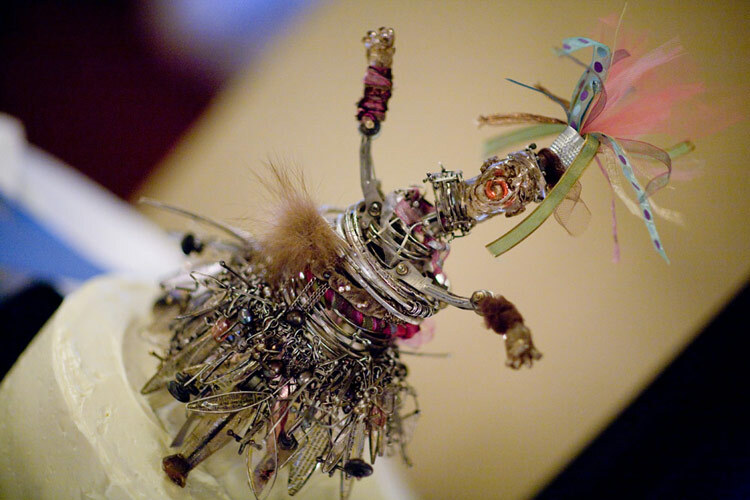 Created by artist Susan Lenart Kazmer, the piece is actually a jewelry holder covered in removable and wearable jewelry. The Opera Singer holds four rings, a woven thumb ring, two pairs hoop earrings, three fiber bangle bracelets, a stack of twelve sterling silver bangles and Letters to my Lover charm bracelet as her skirt. Susan is a phenomenal artist who has had her work displayed in the Smithsonian, and she has become a family friend after working with my aunt to publish her book and asking my mom to do much of the photography for it. I scrawled all over this photo so you can see how the jewlery sits on the holder. 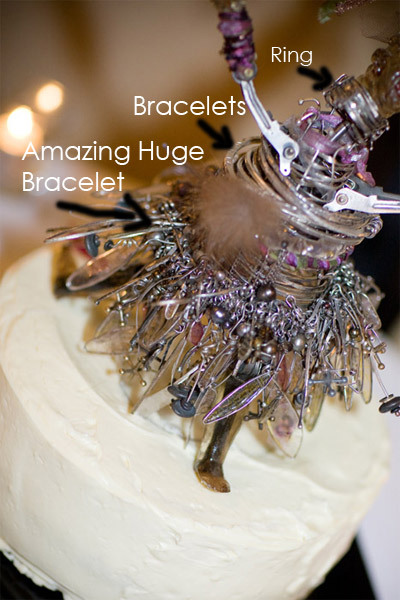 The bracelet that makes up her skirt blows my mind. The piece had nothing to do with our books and buttons theme, but I wasn't about to pass up the opportunity to work this one of a kind piece into our wedding day. At the end of the night, my aunt revealed that the hat on top of the singer was actually a ring custom made for me! I love having that little keepsake from the evening. I should probably stop drooling over those cakes and show you a few photos of that iconic moment known as the cake cutting. 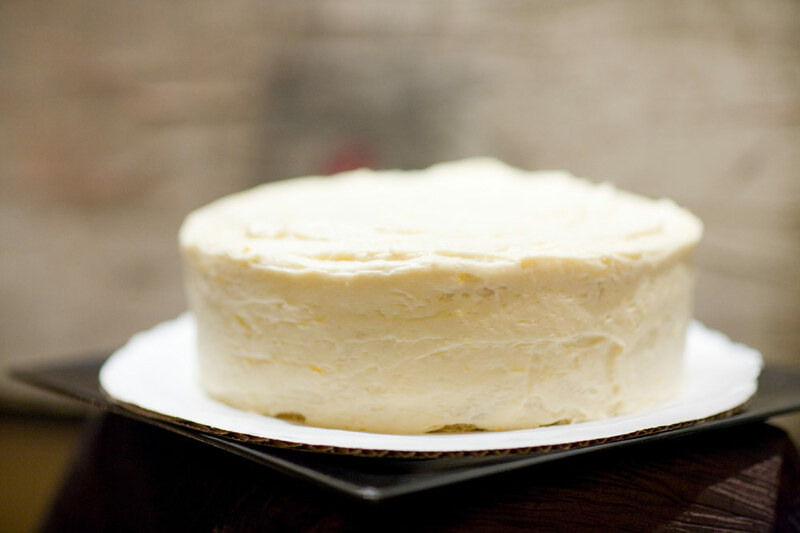 Did you know the cake cutting tradition has root in a small wheat cake that was crumbled over the brides head by the Romans to encourage fertility? I hope it worked. We cut using an antique silver piece my grandma picked up for us at an antique store. It's quite possible that I am whispering "Careful not to cut the cake topper honey, it's worth several thousand dollars." My brand new husband looks at me with so much love in his eyes. I look at the cake. 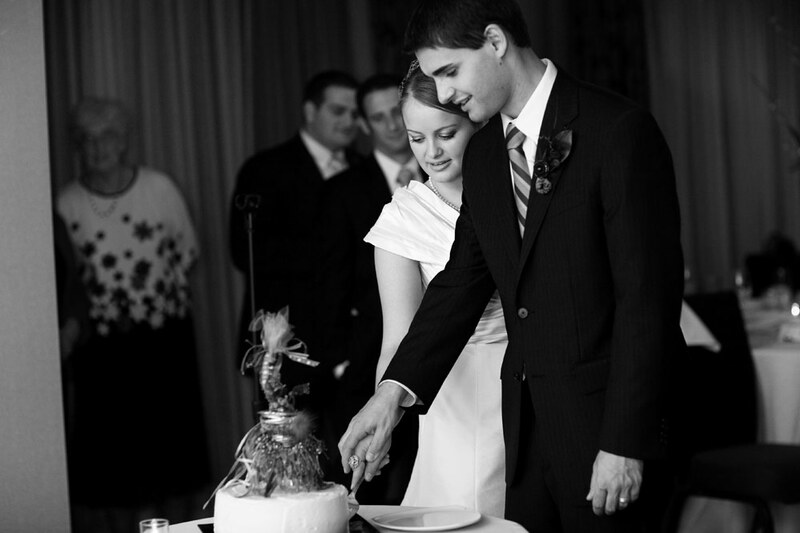 Many couples talk about how they wished they had practiced cutting the cake. Looking back on the pictures I'm left wishing we would have practiced the eating part of this ritual. Having your mouth open as wide as possible is never very attractive. Maybe we should have tried feeding each other one at a time? 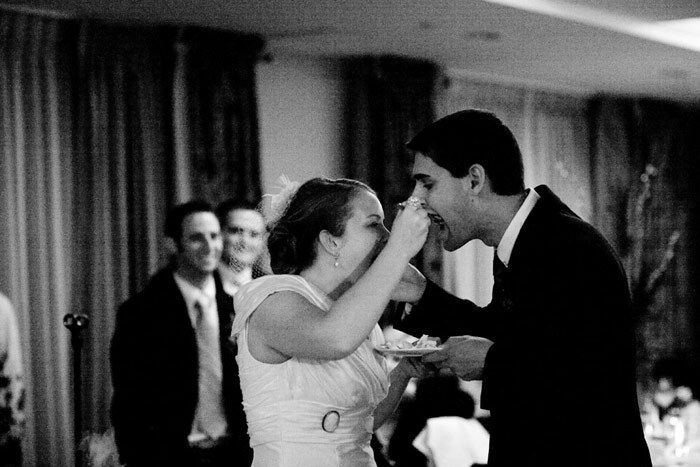 After the first bite most couples turn and smile at their family and friends, or shove cake in each others faces, or pose politely for the photographer. Not us. After the first bite I went right back for the second, and as soon as that was finished my thoughts immediately turned to the rest of the cakes sitting across the room. I believe I actually heard the Lemon Coconut calling my name. Kelli Nicole I hope you put the camera down long enough to get some cake! Yum, I want some! She did do a lovely job with the set-up, except the cardboard. Glad you didn't let it get to you though, these things happen. 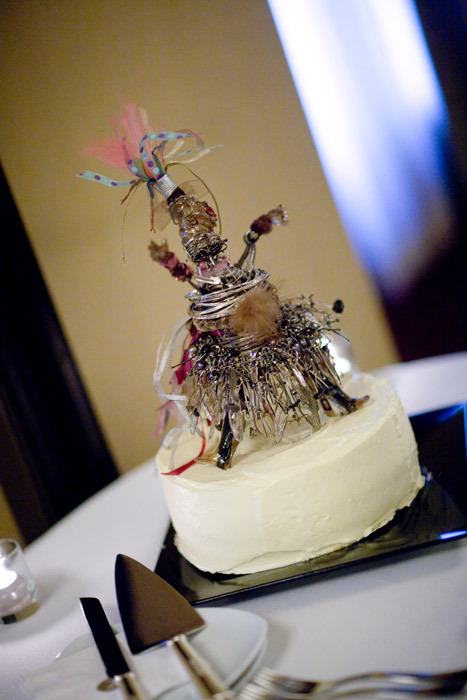 Wow, that is a fantastic cake topper!! Fun pic of eating the cake! SURPRISE! You won again! Double whammy for two great blogs! Pick your favorite 10 and pass it on! That topper is so cool. I can just about imagine the nay sayers who hold to tradition but seriously you got a work of art on your cake. And a keepsake of it too. Your friends and family are some of the neatest people. I think more people need to practice the cake cutting and feeding too. It seems like in the spur of the moment when everyone is looking at you and you have no idea what to do then some fall back on that dreaded cake smashing. I didn't know that you got part of the Opera Singer! That is cool that they did that for you! How cute! P.S. I didn't even notice the carboard under the cake, at first I actually thought it was a white plate. Then again I didn't get too close to those cakes. I would NOT like it if soomeone shoved a horrible wheat cake on my head.... what if some got in my mouth and I swallowed it and got super super sick on my wedding day?! 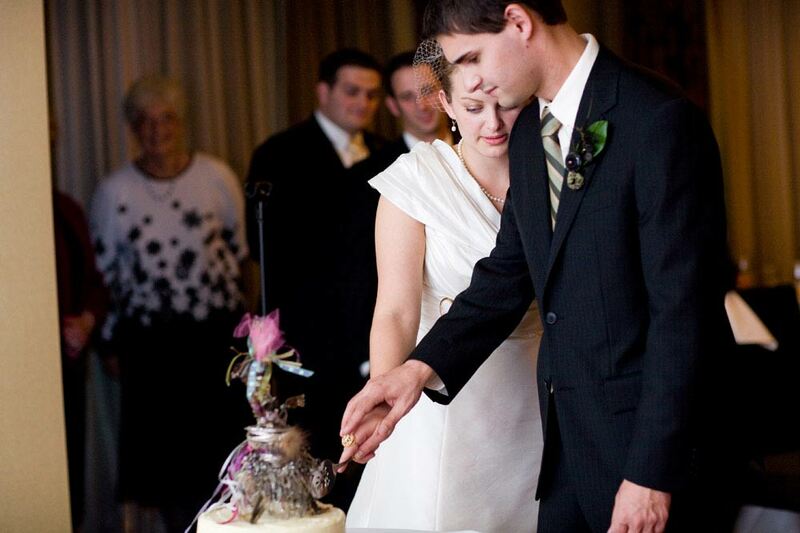 When I get married will you not smash glutenized cake on my head? 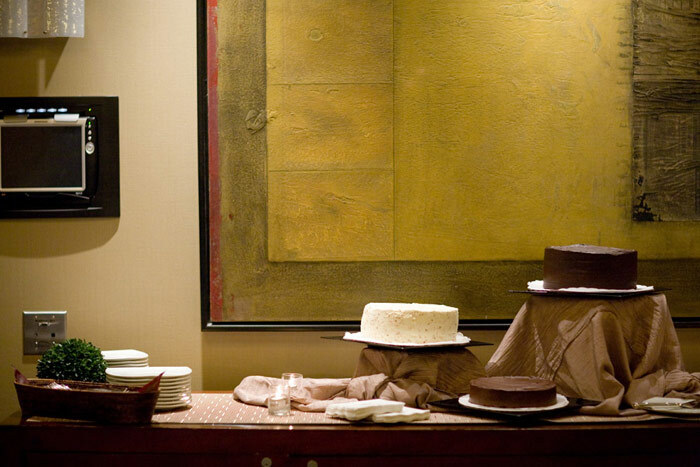 Wow...a wedding cake buffet...I must be dreaming! I love a wedding cake buffet. That's what we did too and I'm so glad we made the decision to bypass the traditional many many layers one for that. 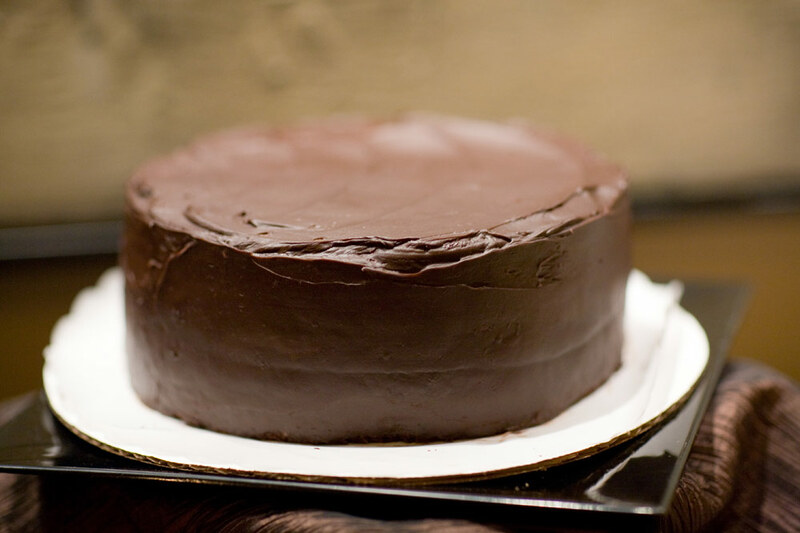 Your cake list made me drool though... Maybe I should suggest a trip to WA to my Hubby and go try their cakes.